Don't tell my kids (whisper voice), but growing up I did not particularly enjoy school. I was an art major cliche, blowing off deadlines, who never, ever planned on teaching! So, entering into my sixth year of homeschooling and having successfully survived five is cause for celebration! There are certain things I cherish about homeschool. I love the family time (mostly), the freedom, and the opportunity to discover and focus on your kids' personal strengths (always), but I'd be a stone cold liar to say this homeschooling business comes naturally to me: I have a tendency to buckle under pressure, am as far away from a type A personality as they come, and don't particularly enjoy learning fractions and photosynthesis all over again. Somedays I feel like I am the love child of Mary Poppins and Maria von Trapp, a mom-of-the-year candidate whose children will look back from their jobs as rocket scientists, supreme court justices and poet laureates, with memories of dance parties, art projects, and school work all intermingling fluidly and profoundly together, their award acceptance speeches littered with thanks to their homeschool education and their philosopher-queen mother. I'll accept demurely no doubt. In reality, those Poppins moments are few and far between. Homeschooling is a grind, and I'm usually more Mrs. Hannigan than Julie Andrews. I have my strengths: art projects, guitar sing-a-longs, and covering the bare minimum assignments to catch us up on the week's homeschool co-op, but, I also once taught Enid that Franklin and Theodore Roosevelt were the same person. Lack of sleep, food, and peace, folks. Turns out, you need them. Needless to say, I'm constantly looking for ways to encourage in my children a spirit of discovery and a want for learning. Technology has its drawbacks, but when done right, it can help for both of these. So when I heard from Apple about their Swift Playgrounds app that helps teach kids coding, my attention was certainly piqued. Apple now sells these seemingly futuristic gadgets through the Apple store that work with this Swift Playgrounds app to encourage kids to learn about coding, but like, on the sly, meaning it feels like playing with toys but is actually teaching skills (skills I certainly cannot teach) without them really aware that they're learning. For instance, this little robot, Jimu. 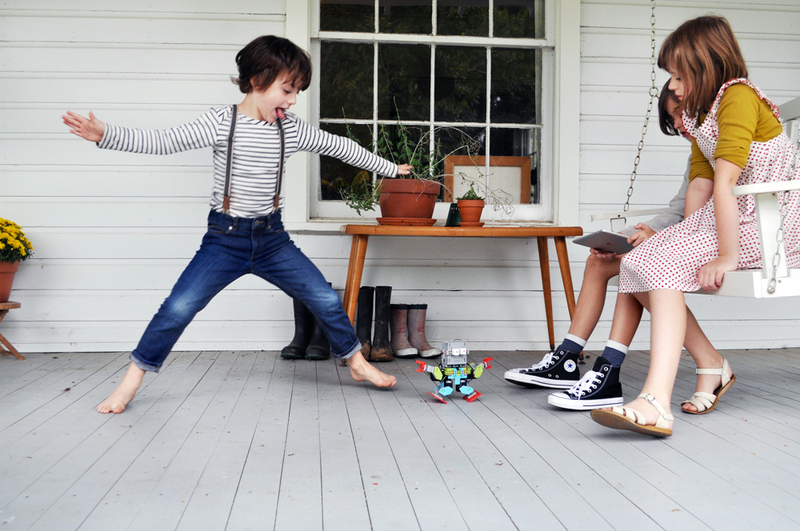 It's basically a live-action, controllable, lego robot with wires and stuff. When it came time to put this guy together, my kids had to beg me to let them help. And then next thing we knew it was ALIVE! The kids really took to Jimu the Robot. You can enter code in the Swift Playgrounds app that will tell Jimu to do certain dance moves or to walk forward or backward, whatever you tell him to do via your code. I got tickled when I heard the kids saying phrases like, "Isn't he cute!" as if Jimu had a personality and was a new pet or something, our very own "Small Wonder," a reference only a child of the 80's would understand. But really, growing up in the 80s was full of futuristic foreshadowing with movies like Back to the Future, Short Circuit, and Inner Space, all imagining potential technological advances, some of which I have actually witnessed come to fruition! The hoverboard sure enough happened. It may have exploded in some cases, but it happened. 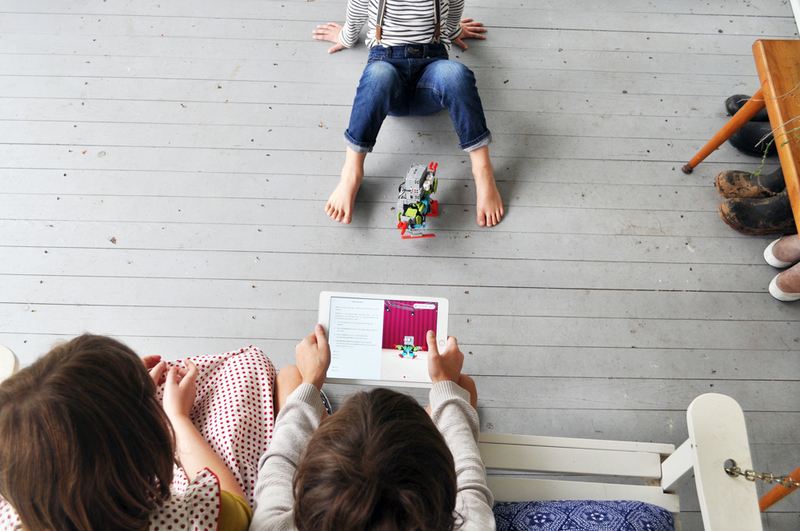 Seeing my kids actually code and control a robot with Bluetooth or a seemingly indestructible robot ball, The Sphero, all around the house and even through pools of water kind of rocks this child-of-the-80s mind. I feel like when given the tools, there is little limit to what this generation can achieve. Often my job is to give them those tools and step back and watch. So perhaps with the help of such educational innovators as Apple, my kids might just become rocket scientists after all, or better yet create the first real flux capacitor, turning our 1990s Honda Accord into the premier time travel machine! Fortunately, I doubt you have to know the difference in Franklin and Theodoore Roosevelt for that ;) Hannah Poppins von Trapp for the win! Also, if you missed it on my Instagram page, we created three fun videos involving some of the cool coding gizmos sold through the Apple store. The first video (linked here) centered around our pal Jimu, in which the boys concocted a sneak attack on Enid. 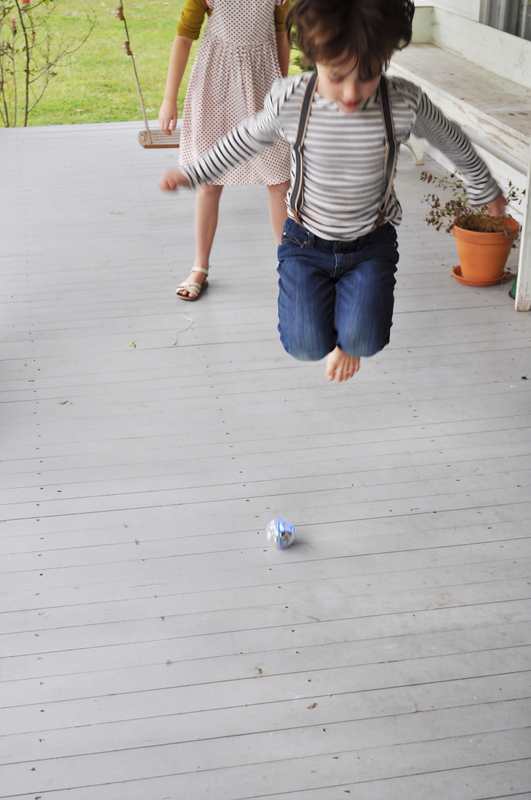 In the second (linked here), Enid and Tristin seek revenge with the Parrot Mini Drone, and the third (linked here) is an underdog (Tom) wins the day scenario with the Sphero. I hope you will watch and enjoy! A special thanks to my friend Jake of OakenElk for the video production! **Sponsored by Apple & Swift Playgrounds. The thoughts and opinions in this post are my own.